Department of Mathematics, Faculty of Education for Pure Sciences, University of Thi-Qar, Nasiriyah, Iraq. In this paper, we apply the local fractional Laplace transform method (or Yang-Laplace transform) on Volterra integro-differential equations of the second kind within the local fractional integral operators to obtain the analytical approximate solutions. The iteration procedure is based on local fractional derivative operators. This approach provides us with a convenient way to find a solution with less computation as compared with local fractional variational iteration method. Some illustrative examples are discussed. The results show that the methodology is very efficient and a simple tool for solving integral equations. H.K. 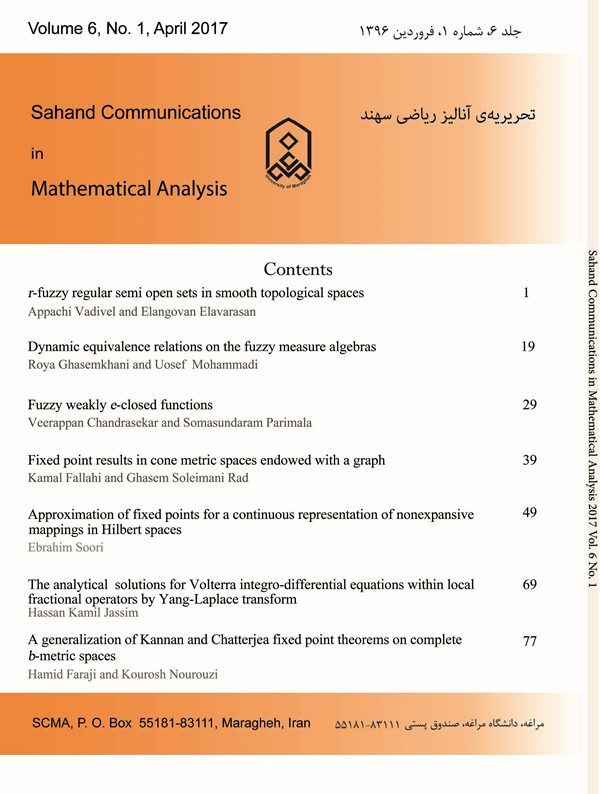 Jassim, The Approximate Solutions of Fredholm Integral Equations on Cantor Sets within Local Fractional Operators, Sahand Communications in Mathematical Analysis, 16 (2016) 13-20. H.K. Jassim, C. Ünlü, S.P. Moshokoa, and C.M. Khalique, Local Fractional Laplace Variational Iteration Method for Solving Diffusion and Wave Equations on Cantor Sets within Local Fractional Operators, Mathematical Problems in Engineering, 2015, Article ID 309870 (2015) 1-9. A.A. Kilbas, H.M. Srivastava, and J.J. Trujillo, Theory and Applications of Fractional Differential Equations, Elsevier Science, Amsterdam,2006. A.A. Neamah, Local Fractional Variational Iteration Method for Solving Volterra Integro-Differential equations within the local fractional operators, Journal of Mathematics and Statistics, 10 (2014) 401-407. I. Podlubny, Fractional Differential Equations, Academic Press, New York, USA, 1999. X.J. Yang, A New Approach to Solving Class of Local Fractional Volterra Integral Equation, Advances in Information Technology and Management, 1 (2012) 183-186. X.J. Yang, Picard’s approximation method for solving a class of local fractional Volterra integral equations, Advances in Intelligent Transportation Systems, 1 (2012) 67-70. S.P. Yan, H. Jafari, and H.K. Jassim, Local Fractional Adomian Decomposition and Function Decomposition Methods for Solving Laplace Equation within Local Fractional Operators, Advances in Mathematical Physics, 2014, Article ID 161580 (2014) 1-7. Y.J. Yang, S.Q. Wang, and H.K. Jassim, Local Fractional Function Decomposition Method for Solving Inhomogeneous Wave Equations with Local Fractional Derivative, Abstract and Applied Analysis, 2014, Article ID 176395 (2014) 1-7. X.J. Yang and Y. Zhang, A new Adomian decomposition procedure scheme for solving local fractional Volterra integral equation, Advances in Information Technology and Management, 1 (2012) 158-161.